Today theme for Nail Crazies Unite challenge is music. 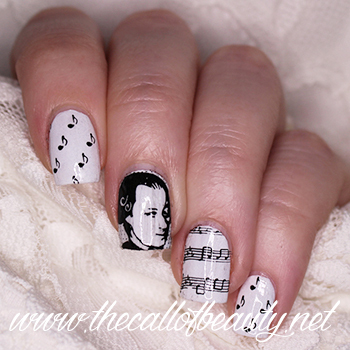 I always wanted a black and white music nail art, and I found that classical music would have been fun. I have had this fake MoYou plate for years in my stash, so today I decided to use it. 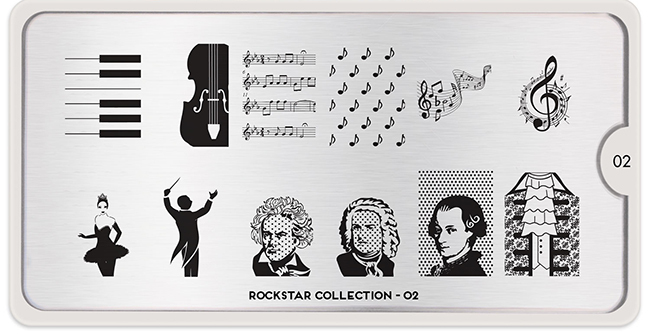 I bought this plate for about $ 1 on Aliexpress and it is a copy of MoYou Rockstar Collection 02. I applyed two coats of a dusty white polish. Then I stamped in black musical notes, sheet music and Mozart head. I applyed a layer of top coat to protect my nails. Il tema per oggi del gruppo Nail Crazies Unite è la musica. 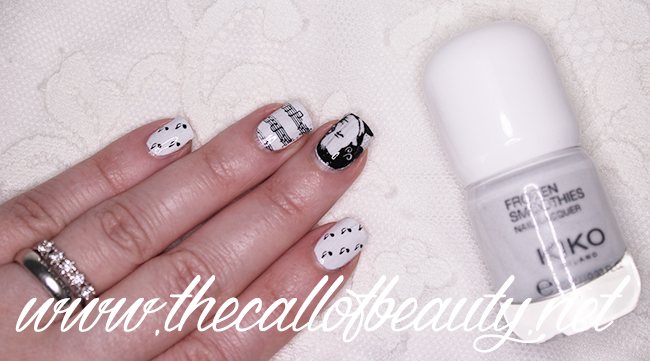 Ho sempre voluto fare una nail art ispirata alla musica in bianco e nero e ho pensato che sarebbe stato divertente farne una ispirata alla musica classica. Ho comprato anni fa il disco adatto e finalmente oggi è venuto il momento di usarlo! Ho preso questo disco su Aliexpress percirca $ 1 ed è una copia del MoYou Rockstar Collection 02. Ho applicato due passate di smalto bianco sporco. Poi in nero ho stampato le note musicali, lo spartito e la testa di Mozart. Ho applicato uno strato di top coat per proteggere tutto. 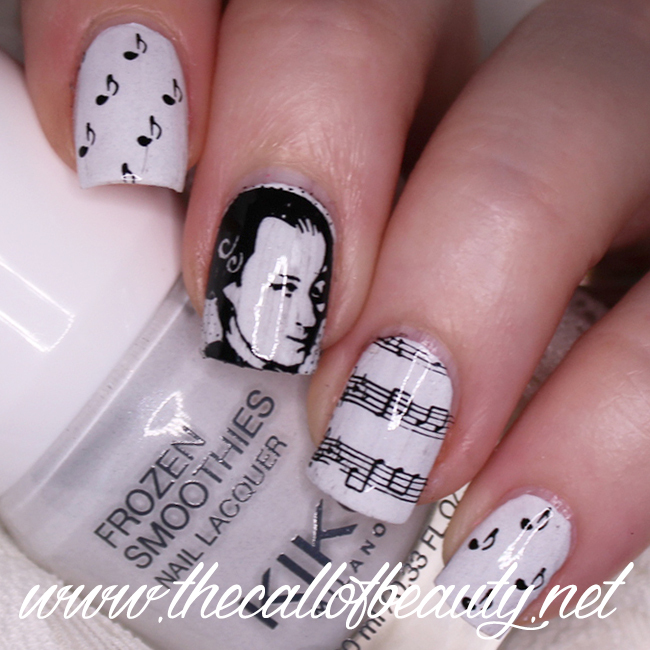 Some nice musical themed stamping! Wow, this is original. I have never seen such kind of nail art. I like it! Very pretty! 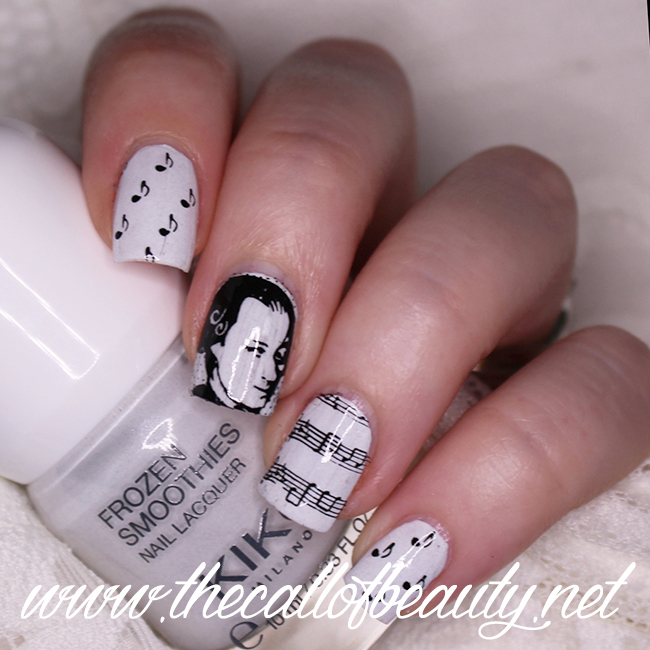 I love how you used the Mozart image- I've always loved one images but never got around to using them. He looks so cool in this mani!